So glad to hear Kimberly. Always best to let it chill down. To broil something simply means to grill it from the top, so it’s placing food under a full-power heating element. It’s that exposed heating element in your oven (gas or electric) that heats from above. If you put the food close to it, it acts like an open flame or hot coal, caramelizing the food. But you can burn if you go too close–often takes some experimentation. Any tips for making Broa (New Artisan Bread p 146) using the crockpot? I’m craving the Portuguese fish stew that’s in the book for dinner tonight, but without an oven for at least a week. This looks amazing! My family LOVES fresh baked bread. Do you cook the bread on high or low for one hour? You’ll want to bake on high. Hi! I love your book, and have successfully made the basic recipe in the oven. I tried it in the crockpot last night – epic fail! Even after an hour and half – the bottom of the loaf was gummy and uncooked. Ended up cooking it for over two hours, and it just did not turn out well. I know the crockpot got pretty hot, because I burned my hand when I went to check the loaf. Any tips? What bread dough were you baking? It is not unusual for some machines to take 2 hours. Unfortunately, it is hard to tell how long it will take until you’ve tried it. Did you open the cover more than the one time to check for doneness at an hour? It is very unusual for the bottom to be undercooked. I’ve experienced the top being gummy, but typically the bottom is ready way before the rest of the loaf. I’ve read different manufacturers crockpots vary considerably in temperature which makes sense since most just have a HIGH or LOW setting. very true–you just have to vary the time you bake. I always put paper towel over the bread it keeps a lot of the moisture out. Then I put the lid on. We’ve only tried this method with our bread doughs so it may take some experimenting if you use another recipe. I would love to try this bread, however, I do not own a Crockpot but a Corning Slow Cooker. Would I still be able to make the bread? My machine is not a crockpot brand either and it works just fine. You may want to check to make sure it doesn’t specify that it needs to cook with liquids. Hi, I just made a 100% whole wheat bread in my slow cooker… After letting proof for a few hours, I “kneaded it” using a silicon spatula, basically folding it over a few times. Then I generously coated it with flour all around (This keeps the inside moist, but makes the dough easier to handle). I then oiled my unheated crock pot and generously coated the bottom with more flour and placed my dough into the crockpot (without any parchment paper). Then I turned the temperature to low. I left my house and returned in about 2 1/2 hours. The bread was perfectly cooked. I just placed it in my toaster oven, for a crispier crust, about 30 minutes. I am so glad this worked for you, it is so great to know. Thanks for taking the time to let us know. Great tips from everyone here, especially Christine, who baked her bread in a floured crock pot on low for two and a half hours. I will try that, only because even though it sounds odd, parchment paper, which I love and swear by, is difficult to find in Las Vegas, NV. I will probably have to go some where like Sur LA Table or a gourmet store or restaurant supply. Does your local Costco carry parchment? I’ve found it there in the past. My Costco carries parchment paper only certain times of the year. Worth asking, and then stocking up then. Most super markets carry parchment paper. IN CA . try Smart and Final. They have it at wal mart even dollar stores. I live in Las Vegas and I have found parchment paper in several supermarkets and even at the 99 cents store. I think I bought my last one at a Von’s store. I LOVE baking bread in my Crock-Pot!!! I have used your Deli Rye dough as well as a Sour Dough concoction of my own and the loafs and dinner rolls come out terrific. And yes, I am one that enjoys a softer, chewier crust! Thanks for all the great ideas! P.S. Since there are only two of us, I normally end up freezing half a loaf in individual slices and when defrosted they taste just as good and have as good texture as the original part of the loaf! Thank you for the note, we are thrilled that you are enjoying all the bread! Made this last night, with smaller than ‘standard’ loaves. Ate the entire first one hot out of the pot, and had to make another! I didn’t have parchment paper, so the first one I used PAM to grease the pot, and the second time I used butter. Both worked just fine. I didn’t toast the loaves after, so they were very pale, but still delicious! I was worried when first making the dough, because I’ve done this method before, but not for a few years. I just threw everything in the mixing bowl, and then worried it wouldn’t rise because the yeast wasn’t thoroughly mixed in, I used chlorinated tap water, and the room was very cold. The dough seemed to rise just fine, and I like a dense crumb anyway. Thumbs up! Hi. Thank you so much for letting us know. I am so glad that your dough didn’t stick when you used the PAM and butter. That is a great tip! Glad you enjoyed the bread. Do you use all of the dough from your batch of ab5min, or just half? Depends on your slow-cooker (how big it is). One-pounders (a quarter-batch) will be easier to bake through. Agreed – I get around 4 loafs out of one batch of dough. My favorite? Take a grapefruit size portion, dust lightly, divide into five or six balls, quickly shape to tuck ends under to give some tension to the top, place on parchment paper, not or just barely touching depending on size of crock pot, cover and go! Check frequently after 75 minutes – crock pots are quite variable in cooking temps and times. I go for 190 degrees and then let it rest for 45 minutes. DELISH!!!! Fantastic Dana, thanks for the feedback. Most of the pots can do a decent job, once you get used to their idiosyncracies. I am just wondering. If you are going to put the loaf in a broiler afterward then when not just bake the bread to begin with. Or when the loaf is 70% done, flip it over and continue “baking” in the pot. It’s very quick under the broiler, and optional (for crust appearance). Yes, you could try to flip but no promises as to whether that’s hot enough to brown it nicely. In the USA they say broiler, in the UK we say grill. I have a small crock-pot. It’s two quarts or less. Would this work or would it be too small for the bread to rise properly? Also, can you put the bread straight into the pot from the fridge, or does it need to rest on the counter first? The dough can go straight from the refrigerator to the crock pot. The first time you try this you may want to make a smaller loaf in your crock pot to see how it goes. Do you suppose you could flip the loaf toward the end of baking to get the top crisper? Just trying to avoid the broiler. Hi. I have never tried it, but others have and say it works, so give it a try. Make sure the loaf is finished baking first. Hmm… that makes me nervous. I wouldn’t put a flammable item inside any crockpot that’s running. Sooo, What is the bread ‘cooked’ in — A Slow Cooker OR A Crock Pot??? Two totally different animals!! All Crock Pots are slow cookers, but NOT all slow cookers are Crock Pots!!! Do the pictures clarify it for you? There’s a ceramic insert if that isn’t clear. While there is a difference between slow cookers and crock pots, for this application (i.e. bread) I think it is more important that the cooker (regardless of brand name) has the capability to “cook” without liquid. With a bit of tweaking (each slowcooker/crockpot takes different times), I should think that any slow cooker that works without liquids would give great results. I have a Corning Slow Cooker? How do I judge the time if a Slow Cooker is not a Crockpot? I think you will be able to tell. When I first got started, I set the timer for 1 hour and checked the loaf. It was obviously not done – too soft in the middle, didn’t spring back when poked. Checked again after 15 minutes, still not done. Repeated this until it was done (in my slow cooker, it took 2 hours plus a few minutes). Tap it on the bottom, it sounds hollow, poke it on the top center, it feels firm. Hope this helps! Yes, I agree. To my mind, baking bread is always a work in progress. Be it slow cooker, crock pot, oven, or toaster oven, just watch it closely and with a bit of practice, you will know when the loaf is done. I wouldn’t get hung up on brand names, just give it a go – you’ll be glad you did! I always thought Crockpot was a brand name. Rather like Kleenex and tissue. Re: debate about Crockpot vs. slow cooker — Crock-Pot® (with a dash, capital C & P) is a brand of slow cooker made and trademarked originally by Rival. It is now owned by Sunbeam, a subsidiary of Jarden Corp. The words “crockpot” and “crock pot” are considered generic terms for “Crock-Pot style” slow cookers. Some slow cookers have metal pots that sit on a heating element, and might require significantly different cooking times, if it works at all. Thanks for great books and website/videos. I have a celiac granddaughter and went GF in support of her and have been almost happily GF since then!! My eggless GF bread is very very very dense and moist. Is it possible that cooking it in bread pan in a 450 oven makes the crust so crisp and almost 1/4″ thick so that it is difficult if not impossible for the inside to cook?? Have you tried cooking it at a lower temperature so it might be more cooked through – in the center? Makes me think your oven temp is off, check that first with a thermometer–something like what’s in our Amazon kiosk at left. If that’s not it, then your suggestion is worth a try. But my guess is that you’ll be happier with the egg white variation on page 73. This is my first try with the crock pot. I just placed my boule in but was wondering…why do we not slash the top? Been baking your breads for a couple years now. Thank you for all your work, great recipes, and this helpful website. Because we are putting the dough into the crockpot right after shaping (without letting it rise first) it really doesn’t work to slash it. I tried it and it really didn’t add much to the rise or shape. It certainly doesn’t hurt, but just didn’t add much. Try both ways and see which you prefer. Actually, I had wondered the same thing and I always thought that by not slashing it, the moisture from the lid would not settle in the slash marks to cause uneven baking. I’ll have to try slashing now, just for the heck of it! If you wanted an egg glaze on the top crust, would you add that just before popping the loaf under the broiler to brown? Haven’t tried that–it might burn, so experiment with the distance from the heating element. I think it should work though. I learned baking from a German baker as an apprentice..some 60 years ago…I’m now at a point where i can use my eyes to measure..Thus said..I was delighted to discover slow cooker bread making..On some sites there is a recommendation of putting water in bottom,then placing bread on a raised surface like crumbled alum. I would encourage making your own bread from scratch..you have control of what in it..great site. Wonderful that you’ve been baking for 60 years. If you give our recipes a try, I’d love to know what you think. I’ve never done this method with water, since the dough creates quite a bit of steam. Are you adding the water to protect the crockpot? sorry for the delay in answering…re: adding water…it was another recipe suggestion. i eliminated and the bread was fine question about glazing…i glaze after bread crust is form in crock pot and give it another 10-15 minutes depends on type of slow cooker.. I want to try this bred, but I have a small crock pot from the 70s and a newer one the kind that had a mini crock that came with it for warm dips such as the cheese dips. Which slow cooker should I use for the bread? 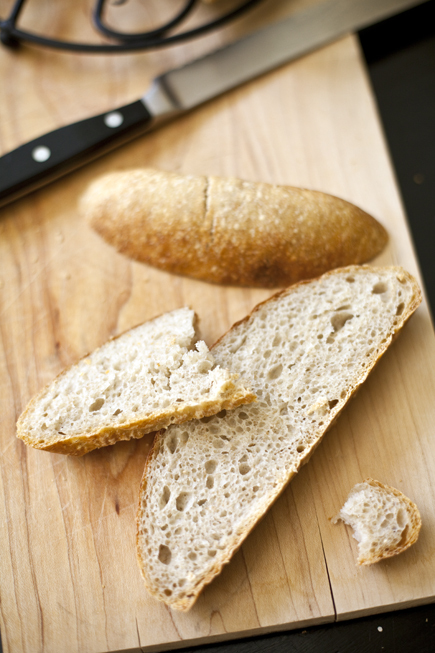 How often do you take the lid off to see how the bread is coming along? You want to use a crock pot that has a high setting, I think the “warmer” setting won’t get quite hot enough to bake the bread properly. I’ve never heard of the bread being baked before 45 minutes, so I wouldn’t lift the lid for at least 45 minutes. Some crockpots can take up to 2 hours to bake, since they are not as powerful. As with any crockpot dish, try not to open the lid any more tan you have to. After a few loaves, you’ll have a good idea of how long your pot takes (mine takes 2 hours) and I just let it go until the two hours are up. Is there no need to score or slash the bread dough before putting it into the crockpot? I’ve never slashed it as cooking in the crock pot maintains A LOT of moisture and I think a slash would just kind of melt back together. But it will be interesting to see what others say! P.S. One of my favorite ways of baking in the crockpot is to divide the dough up into five or six balls, rotate and tuck the ends under to stretch the skin a bit and put them in the pot with an inch or so between them. Makes the BEST pull apart buns (great in rye)! Great idea, thanks! And thanks for clarifying about the slash. Made some gluten free 50/50 Mix 1/Mix 2 in the crockpot today. I was glad to not have the oven on! Amen to no hot oven! Don’t really have to–the rise is slower and less “explosive” in the crockpot. I havent tried microwave oven..but would you recommend it? We’ve tried–and it doesn’t work. Sorry! I have a question that I seem to find an answer for, It is very, very difficult here to get parchment paper and my bread pans a too large for my slow cooker. Question: what can I use as an alternative? You can use foil and just sprinkle it with flour or corn meal. To slash or not to slash. That is one of my questions. The other is whether we are still going for an internal temp of 190 to 210 degrees to determine if the bread is done. Thank you for sharing your recipes and techniques. I find the bread spreads even more and doesn’t have as nice a shape if you slash it before dropping it in the crock pot. The top of the bread must be set to the touch before removing it, but I have not taken the internal temperature of the crock pot bread. I’m guessing you could make our recipes just as we do here–but honestly, the crockpots differ and you’re going to have to experiment. 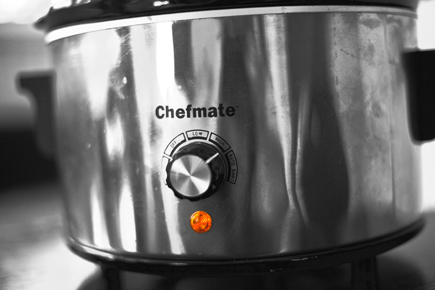 Just one question…Do you preheat your crock pot? if this has already been answered I apologize. No, you don’t need to preheat the crockpot, in fact I don’t think they recommend heating it while it is empty. This sounds easy. Do you know the @ temperature your crock pot was on high? I do not know the temperature of the crock pot, it is very old and I bet it fluctuates quite a bit. The link to your No-Knead 5-Minute Bread recipe doesn’t work and I can’t locate it. Would appreciate assistance, thanks! Thanks! Appreciate your time and look forward to giving this a try. Have you tried the IP for bread making…since it part slow cooker/pressure cooker it should be a match.. I have not, but I imagine it would be similar to the crock pot if you use the slow cooker setting. I wanted to make a loaf for sandwiches, but my small loaf is 2” High! I used refrigerated master recipe dough and didn’t do a second rise. I just put it in the slow cooker and baked it for over an hour. I did press down at about an hour, and the bread lost a little height. The bread height isn’t close to what it would be in the oven. When it got firmer, I took the bread out and peeled off the parchment paper. The bottom stuck to the parchment! As you can see, my loaf isn’t that much taller than what you describe. When you say you pressed down, do you mean you just checked it to see if it was done? It could be that you just need to make a larger loaf. It could also be that your dough was a bit wet and spread, especially if you have a large crock pot. Mine is round and on the smaller side, so it forces the bread to be round and not spread too much. The “oven spring” will never be the same in a crock pot as it is in an oven, so that is not at all surprising that you didn’t get the same rise you are used to in your oven. It’s a different type of baking. If your parchment sticks, some brands do that, you’ll want to dust it with cornmeal or flour before putting your dough on it. At any rate, my hubby made a fabulous turkey sub sandwich it. Thanks for explaining the lower rise. My crock pot is 5 qt, so it isn’t that big. I prefer the oven rise, but I can see when baking in a crockpot can bake a quick loaf of bread in a pinch. Lol, I got really lazy and tried this bread using your comments. Yes, the cornmeal did help. It really is a lazy way to bake. No waiting for the bread to rise. Dragging out the slow cooker is less effort than dragging out the stone, etc. Perfect for Friday night’s dinner. I ate less of it than I would Challah. It will make great sandwich bread for leftover turkey shawarma. I had less expectations of oven spring also, after your comment. Love the soft bread. I am so happy you gave it another try and had better results. 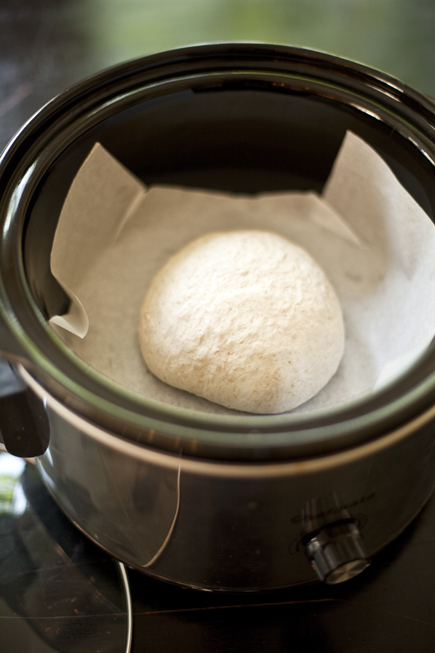 Have you tried a cloth or a couple of paper towel layers placed under crockpot lid to absorb excess moisture? The instructions for this are very unclear. The first time I read it I saw that it stated that the rising time was included in the cooking time, so I assumed about an hour in the crock pot and it should be done. But after an hour and a half it is still nothing but dough, so I went back to read this article again. Later in the article I see you posted an “update” where you said that you let it rise for 2 hours before cooking. Which is it? I am going to be patient and just let this thing cook, but I am worried that I will end up having to just throw the whole thing in the trash. You don’t need to let the dough rest before placing it in the crock pot, just shape and place it in. The only variables will be how large the loaf is and the power of your crock pot. If your dough ball was larger than 1-pound, it may take longer. If your crock pot has a lower temperature, then it will also take longer. 1 hour is how long my machine takes for a 1-pound ball of dough, but I have used other people’s crock pots and it has taken longer. I have just bought two of your books ( the new healthy bread in five minutes a day new artisan bread in five minutes a day) after finding a post about crock pot bread and trying it out. My family loved the results and I was able to provide bread to my work mates on a long day shift. Our crock pot worked overtime that day! My question is if the same can be done in an instant pot on the slow cooker function? My last batch of bread broke my old slow cooker and I am trying to decide about changing to an instant pot or replacing the slow cooker. Any thoughts or experience with this? I’m so thrilled you have been enjoying the bread and sharing with your work mates, lucky them. I have not tried it in the instant pot yet, but intend to ASAP! I’ll post my results. Hi. I love your idea of making bread in a crock pot! I was wondering though, a 1-pound loaf is a very small loaf, about half the size of a bread machine loaf! Can you bake a larger loaf than 1pound in a large crockot? I cook for 8 everyday. Thanks. Which of our books are you using (what recipe and page number)? Hello. I don’t have your cookbook ( yet! ). I found you on Pinterest! I made the basic 5 minute recipe for crock pots using the link on this page. It turned out great, first try! But, the loaf was too small to be practical for my larger family, unless I can bake a larger loaf in my crock pot? Sorry for the confusion. A 2-pound loaf would be fine! I can’t wait to try it out. And, yeah, the oval shaped church supper/family reunion type crockpot is what I had pictured in my head when I asked the question. Thanks. Just came across this method. So far I have been doing your breads in an oven and loving it. I was thinking that a slow cooker or crock pot is just like the bread maker that I graduated from. Wouldn’t it serve the same purpose to do it in the bread maker with a bake setting? I am thinking of trying that. Can you put dough in the bread machine or do you have to start with the ingredients from scratch? I like the versatility of the crock pot, because you can make rolls and cinnamon buns or monkey bread. My Oster bread machine has a bake setting where it will bake for one hour. I am going to use that setting. I am a lefsa boy living in tortilla country: Owatonna H. S. 1962, Tucson since 1980! So yah, love da book; got it thru America’s Test Kitchen – no weights!!! WHY? I also have the first edition without weights but I just get out my handy-dandy calculator and figure it out myself. While different flours do have different weights (Peter Reinhart’s excellent bread books have that info or you could just look it up on the internet), I use mostly bread flour which is 1 cup = 4.5 oz. Hope this helps you enjoy Jeff and Zoe’s first edition! Thanks for the input! Is 5 oz per cup only for slow cooker bread or do you use it for reg. bread as well? I’ll have to try 5 oz and see how it goes. I LOVE making bread – every loaf is an adventure! Oh, just reread your post – I use bread flour, not all purpose. Maybe that’s the difference? The weight equivalency isn’t affected by the baking method. For what it’s worth, when we measure Gold Medal Bread flour, versus Gold Medal All-Purpose, we get the same weight, usually about 5 ounces but sometimes a little less, maybe 4.8 ounces. That said, bread flour absorbs more water, so the dough you end up with is drier–generally we recommend about a quarter-cup more water per 4-pound batch. But maybe you’re liking it a bit drier—that may help it bake all the way through in the crock pot? Hummm, I’m going to try 5 oz per cup on my next loaf and see what happens. This afternoon’s project is Earl Grey Tea Bread – I’ll let you know how it goes! Thanks, Jeff! Still can’t find Powdered Caramel Color? Any ideas who sells it? PLEEAAASE. This is a fabulous idea! Bread in the slow cooker! I am wondering, can you braid dough into challah and bake in the slow cooker?!? Would it hold its shape? Yes you can do it we’ve done it and it works. If you bake a 2 lb. loaf in a 6 quart oval crockpot, about how long might it take. I realize all machines are different, just looking for when to check for doneness. Also, what is the difference between the new artisan Bin5 and the first one. Thanks. The problem with making large loaves in a crockpot is that all the heat comes from the bottom, and it takes so long for it to bake through that the bottom is often tough, if not burnt, by the time the top is cooked through. I would suggest starting with one that is just over 1 pound and see how that goes. The NewABin5 has more recipes, the recipes are in weights and in cup measures, there are more pictures and we made some slight changes based on what we learned over the years to make the process easier and/or faster. I tried to make frozen bread in the oven….Didn’t work. I tried making white bread in the breadmaker……It didn’t work. I tried your slow cooker bread and it turned out gorgeous. I had to leave it in a little longer in the crockpot until I saw it browning at the bottom and then put it under the broiler to crispin the topThank you all. That is fantastic, I’m so thrilled to hear it worked well for you. So unlike using an oven, you don’t have to let the round rest for 20-40 minutes on the counter before placing in the crock-pot? I didn’t see any notes on that, so wanted to confirm. Dont know how I lucked in on this recipe and method, but as a recent vegan I have to say that this is a brilliant recipe. Thank you. Works so well with wholemeal flour and as a single person using half measures gives me two loaves and the second one in the fridge gets me through the week. Have stopped using a bread machine in favour of this as it is just so simple. I am so thrilled you are enjoying all the bread!